Users got to grips with the Correlative stage with hours of hands on experimentation on the one day course. Last week, Linkam's correlative cryo stage, was again stealing the show– this time as part of a workshop held by the Oxford Particle Imaging Centre. The workshop on soft x-ray microscopy sample preparation and pre-characterisation was held at the prestigious Henry Wellcome building for Genomic Medicine, which is part of the University of Oxford campus. 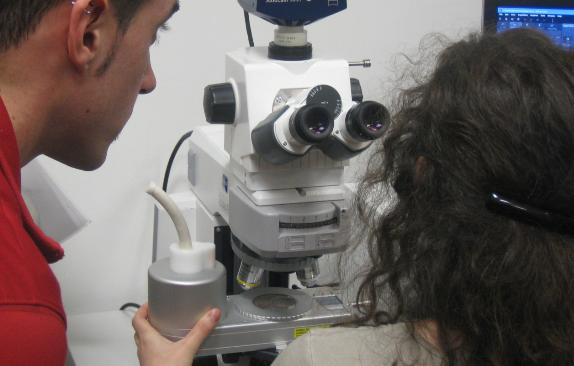 The event provided an opportunity for the attendees to get hands on experience with sample preparation and then pre-characterisation of cellular specimen by fluorescence cryo-microscopy. The day-long affair practically demonstrated all the steps required in the process from the grid preparation and plunge freezing, all the way through to the pre-characterisation of the sample using the Linkam correlative cryo stage. I would like to thank Kay Grunewald and Christophe Hagen for organising the event.